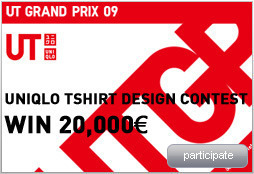 Uniqlo Tshirt Design Contest - 20,000€ - URGENT! Sorry for the short delays on this one, but the prize money is worth a couple of sleepless nights;-)! Uniqlo is looking for new Graphic Designs for its collection. Designs must be two-dimensional, e.g., in the form of a painting, an illustration, a graphic, CG or a photograph, and be premised on its ability to be successfully commercialized as a T-shirt design. All winning designs will be merchandised globally at Uniqlo stores, and 20,000€ in prizes are at stake! The deadline September 21st, 2008, so get to it!